Shabbychick Junk. : Pink Persimmon $25 Gift Certificate Challenge! I needed to take a little vacation from my life tonite, so I decided to sit down and get creative and see if I could stamp out some stress by doing the pink & orange challenge. Except it didn't work so well because I ended up fighting with my sewing machine, which was not so pleased that I was using SILK thread in it, and kept jamming up on me. So don't look too closely at the sewing job on this one; mistakes were made, swear words were uttered. But I GOT R DONE! 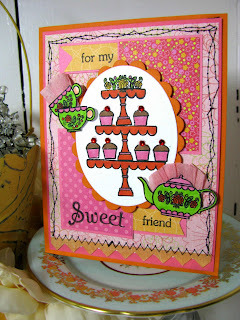 This little 3-tiered cake plate stack is a Pink Persimmon set that will be released June 8th called "Tea and Cake". The flowers come separately from the teapot & teacup, so you can stamp flowers on the cake plates, or on the cups or teapots! I took glimmer-misted crepe paper (Tattered Angels Vintage Pink) and ruffled them behind the teapot and cups to look sort of napkin-ish. OMG I need to go clean! Kick me off of this blog post! Happy Thursday, all! Love it!!! stitching and all! HAve a fun girls' weekend!!! Love your card, Lisa! I have fallen in love with Pink Persimmon! Can't wait to see what's coming next week! Thanks for your adorable inspiration!!! OOOH Lisa this is great! Love the "napkin" idea!!! 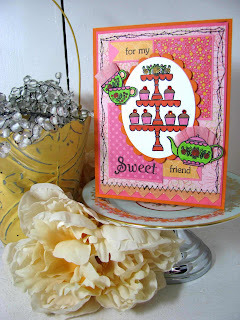 This card is totally adorable - I love the little rhinestone cherries - so much fun!